LENGTH X WIDTH X HEIGHT: 191.8 x 75.2 x 58.0 in. CARGO CAPACITY: 8.2 cu. ft.
BOTTOM LINE: The Ford Fusion Energi is quiet, economical and good handling. 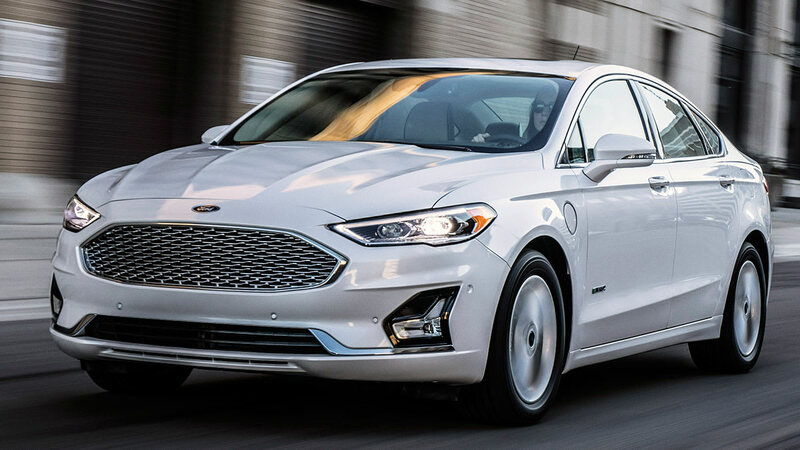 The first impression of the Ford Fusion Energi is its quiet operation. Okay, it is electric to some degree (25 miles range on electric alone), but we drove it many miles beyond its electric range and it never got louder. Truth be told, we never plugged it in, and drove it like a “normal” hybrid. An interesting feature about the Fusion hybrids are the Trip Summary gauge to the left of the speedometer. It gives you an odometer, overall mpg, trip mpg and fuel levels. It also gives you trip information, even if you only go one mile to the supermarket. You get “leaves” of credit if you drive economically - more leaves if you do better, fewer if you don’t. Eventually, by paying attention, you may learn to drive more economically. Ride quality is very good. We took the Fusion on a trip to Pennsylvania Dutch country that involved long highway stretches plus an assortment of rural roads near Lancaster. The Fusion handled them all with aplomb, including some maneuvering around crowded parking lots. My only complaint is the minuscule trunk, made smaller by the battery pack behind the rear seats. True, the battery pack gives you a shelf for storage, but you also lose the advantage of folding seat backs, and there’s no substitute for volume. Front seats are heated and cooled and comfortable with good side support and great head restraints. We have driven FoMoCo vehicles of various sizes and price ranges and enjoy all their head restraints. They are comfortable and soft and in the right location. I like the diamond pattern on the seat bolsters. Rear seats are comfortable with tight leg room. Rear seat passengers have their own HVAC and 12-volt and 110-volt outlets at the rear of the console. There is a low center hump that makes the rear seats better for three passengers. Four assist handles aid entry and exit. Fusion has a rotary dial shifter with a hill descent function that will hold the car on a hill without the need for unnecessary braking. Even with the small trunk there is useful interior storage. In the doors there is room for water bottles, plus a good size arm rest/center console. There’s a large cubby at the base of the center stack with 12-volt and USB outlets. There’s also a nice cubby ahead of this that is ideal for keys. On the dash, the infotainment screen default is a map on the left and entertainment on the right. You can switch to full screen at any time. The navigation application is easy to set and you get clear directions from the voice in the dash. Driver assist functions include a back-up camera with sensors to aid parking, blind spot monitor, rear cross traffic alert and rain sensing wipers that go on automatically. Fusion in general should be on anyone’s short list for a mid-size. Energi adds economy over the straight gasoline version if you’re willing to accept the reduction in cargo capacity and the annoyance of plugging the vehicle in often.